Our twin daughters were born at 29 weeks gestation and weighed under 3 lbs each. They have been receiving Birth to Three services since they were only 10 weeks old. Once our medical concerns were addressed and we could see the girls steadily making improvement, we, along with their therapist, knew that the potential was there for their development to explode if they could just get more sleep. After 15 months of getting little sleep as a family, we were ready to make that change too. Liberty came to our home to design a sleep plan with us for the girls. Together we were able to teach the girls how to sleep properly. They went from taking 25 minute naps on a good day to taking two naps totaling up to 3 hours. Nights also improved dramatically for both girls and for us too! Prior to meeting with Liberty, we would need to rock and hold the girls until they fell asleep, no matter what time it was – not good! After meeting with Liberty and using the techniques she detailed, the girls started sleeping 12 hours at night without waking. Not only did we see improvements in the girls’ sleep, their development exploded like we had hoped. By 19 months, they had mastered skills that we had been working on for months and seemed to be mastering new ones at a faster rate. How amazing! -Meagen & Brian F.
Our son’s night wakings caused chaos in our home. For weeks, we had tried just about EVERYTHING to try to get him to sleep through the night. We were at the end of our rope when we contacted Liberty. At 20 months old, our son had never been a “good’ sleeper. Besides the night waking, he had always been an early riser and a bad napper. Liberty listened to our struggles and developed a plan for him. We were consistent, followed her plan and it worked! Not only is our son sleeping through the night, he is also consistently napping for 2 hours a day. His mood is better and he is well rested and overall a happier kid. Liberty’s support was wonderful; we are beyond grateful. Don’t hesitate… Sleep training works! A Change for the Better For the WHOLE Family – I love you, but please get out of my bed!! 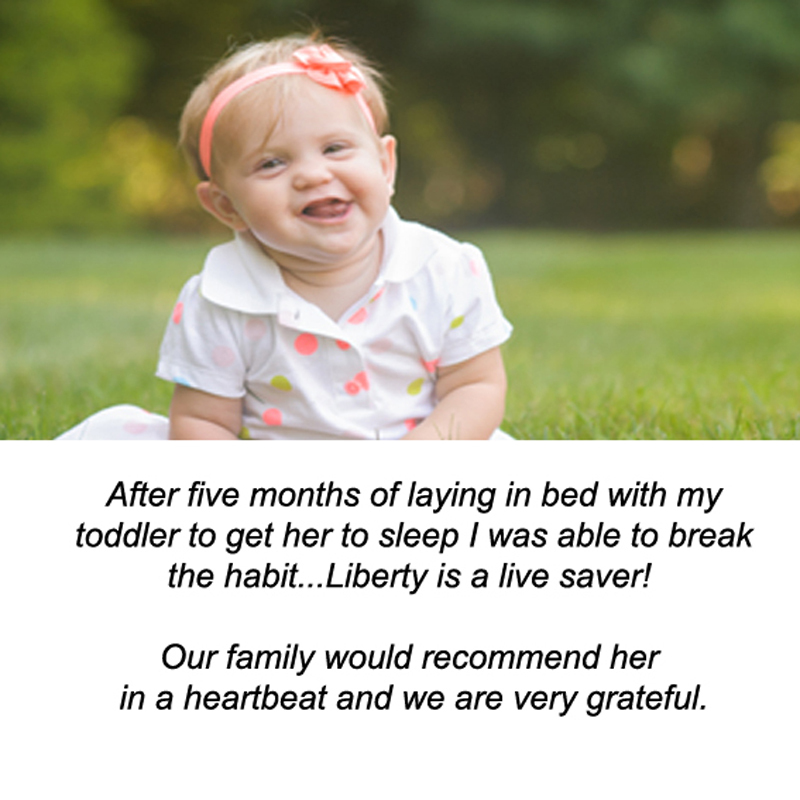 The sheer fact that I can sit down at a computer to write this testimonial is proof that with consistency and dedication and the support and guidance of Liberty, our sleep consultant, sleep training really works! I am the mother of 2…a tenacious two and a half year old that has NEVER slept well and an eight month old who’s greatest passion since birth has been nursing (all night long). I felt like all the pressure to be attached to my children meant I couldn’t have them sleeping without me. I had finally gotten to the point in my nearly 3 years of sleep deprivation where I had had enough and change was not only desired, but necessary. After contacting Liberty at the Sleep Support Program, I was equally nervous and excited. How on earth was I going to implement such structure in an unstructured environment? One quote kept echoing in my ears though, “Good sleep in equivalent to healthy food. Poor sleep is equivalent to junk food.” After reading that over and over and knowing I would never dose my kids up with high fructose corn syrup, I took the plunge. It has now been over 2 weeks… my 8 month old is napping twice daily in her own crib in her room and goes to sleep at night without needing me as her crutch until morning (when I actually have to wake her up!). My spirited toddler has made such positive strides forward that I can imagine in a short while she will be sleeping like the “angel” that so many other moms describe. I also have a part of my life back, don’t get me wrong…I love my kids with a fierce passion, but to be able to sit down at night and read a book or watch a little TV and spend time with my husband is just as important and has made me a better more patient mother to my girls. I was so hesitant and skeptical, but I have to say that I am a believer in the sleep training methods that the Sleep Support Program provided. Our whole family is happier and better rested and I have no regrets… except maybe having started sooner. Before we met with our sleep consultant, our family was struggling with how to get our 2.5yr old child to sleep independently in her own room at night and for afternoon naps. For months, we had been in a situation that wasn’t working for our family, with one parent co-sleeping with her in her bed. Our prior attempts had left us with meltdowns, crying that only escalated, and a lack of quality sleep. Our sleep consultant helped us to outline a plan specific to our child and I am happy to say that bedtimes & naptimes are much more peaceful now – we went with a very gentle approach and our child quickly gained the self-confidence she needed to sleep alone in her own bed. She is very proud of herself for “sleeping like a big girl” now and I was amazed at the lack of tears and protests we experienced while following the plan. She is getting more rest now, and we have restored the balance we all needed in our household for peaceful sleep times. The support and encouragement we received, as parents, was wonderful. The whole family is grateful for having worked with our sleep consultant, Liberty. After 12 months of 3+ waking and feedings every night we needed help! I had forgotten what it was like to feel rested and had very little patience or energy for the baby and the rest of the family. Within a week of starting our sleep training, Layla was sleeping through the night! And I was able to do it without the stress of letting her just cry it out. My response times to my questions were always quick. It’s so great to have me back to my normal self and Layla more content throughout the day. My only regret is waiting sleeplessly for as long as I did! I am a mother of a 14 month old baby who was having a difficult time sleeping through the night. She woke up to nurse 4 to 5 times a night and my family was at our wits end from loss of sleep. I was too tired to be the mother I wanted to be and I needed help. Liberty came to my home and met with my family to discuss and come up with a plan to help my daughter start sleeping better. She was so understanding and supportive. Her knowledge on children’s sleep was extensive and she easily explained how I could help my daughter sleep through the night (and why it was so important for my daughter to do so). I was very comfortable with the plan that Liberty created for us and now I’m happy to say she sleeps like a log for 11-12 hours a night! I would definitely recommend Liberty to any of my friends who were having sleep issues with their children. Being first-time parents, we had no idea where to start with helping our infant daughter learn good sleeping habits. She hardly took naps and only stayed asleep if nursed and then placed in her swing. At 9-months old, she still wouldn’t fall asleep on her own in her crib and we were still having 2am bedtimes. It was long overdue to get the help we needed. Liberty was a life-saver! She developed and organized a personal sleep plan that we were both comfortable with and was there for us every step of the way. 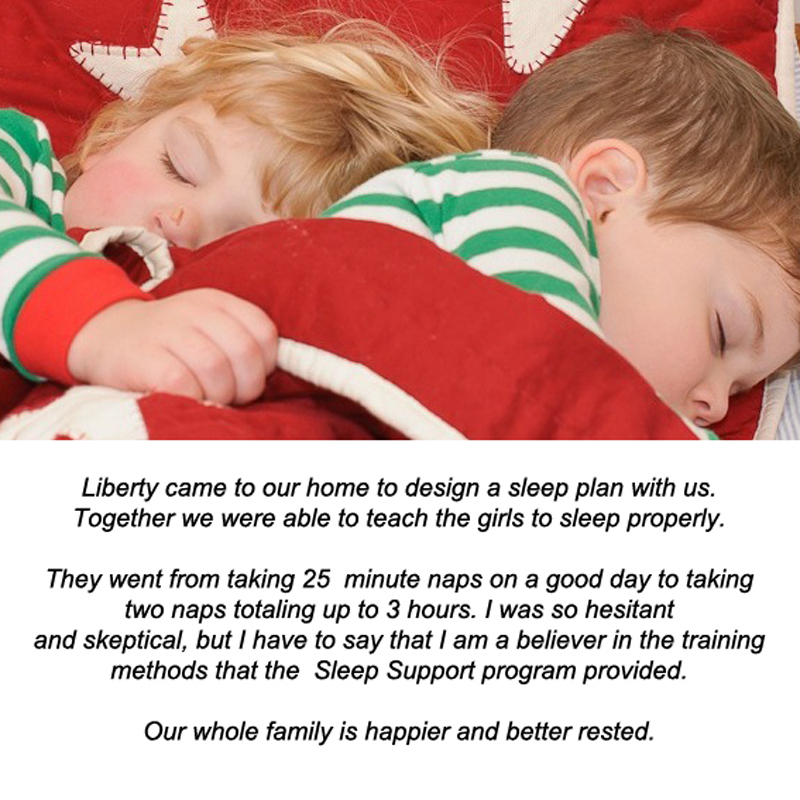 Liberty is nurturing, resourceful, and goes above and beyond to help families achieve their sleep goals. Our child now sleeps 12 straight hours per night with two naps during the day. She is a well-rested, happy baby who has learned to self-soothe; a skill she will use for the rest of her life. Thank you Liberty! Ready for a good night’s sleep? Sleep Consultant Liberty Mahon is ready to help you get started with a FREE 15 minute introductory phone call.